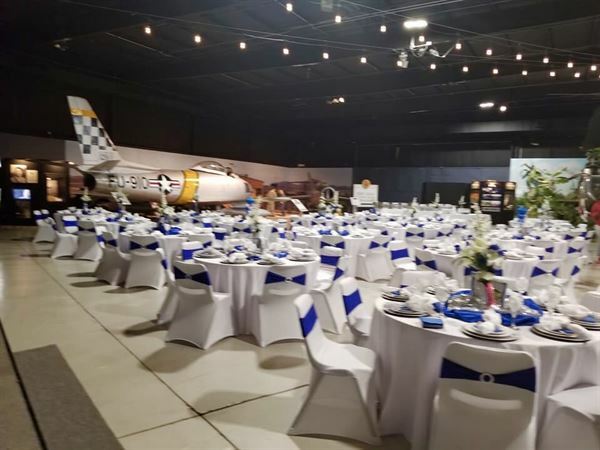 Whether you’re an aviation enthusiast or interested in a one-of-a kind setting for your event, The Southern Museum of Flight offers the perfect venue. Our exhibits & diorama displays provide a unique backdrop for your wedding, reception, banquet or special occasion. We offer exciting exhibit halls, spacious rooms & caterer-friendly dining areas. Audio/visual equipment & other amenities are also available. The staff of the Southern Museum of Flight really took charge of my event and left no stone unturned. Planning a destination event and having such a professional organizer was well worth it. Kudos to the revune….boy it was looking good! Ms. Dunn did a superb job.!!! I recommend the Southern Museum of Flight for any personal event. Location is great, security included, and the history surrounding you with the old airplanes, gives the guest something to talk about as they enjoy the event. Special Features: Over 100 plane exhibits and much more. Beautiful and Contemporary venue with fantastic views and a private setting. Perfect for Weddings, Receptions, Commitment Ceremonies, Formals,Private Parties and so much more. We also offer the Latest technology for business and corporate training including wireless internet through out the building.We also provide on-site fully stocked bar Services and some one on hand to help coordinate your event and answer any questions. In addition our Classic Car Collection is available for parties and rentals. Blount Springs wedding chapel is located in beautiful Blount Springs Village. The wedding chapel and banquet room is the perfect setting for ceremony and reception on your special day. Nestled on a hilltop overlooking Blue Hole Lake in a lovely mountain setting, Blount Springs Wedding Chapel is the perfect venue for your special event. The white wedding chapel's classical southern highland architecture requires very little decoration for a beautiful event. Just 20 minutes south of Cullman and 30 minutes north of Birmingham, right off I-65 in historic Blount Springs.